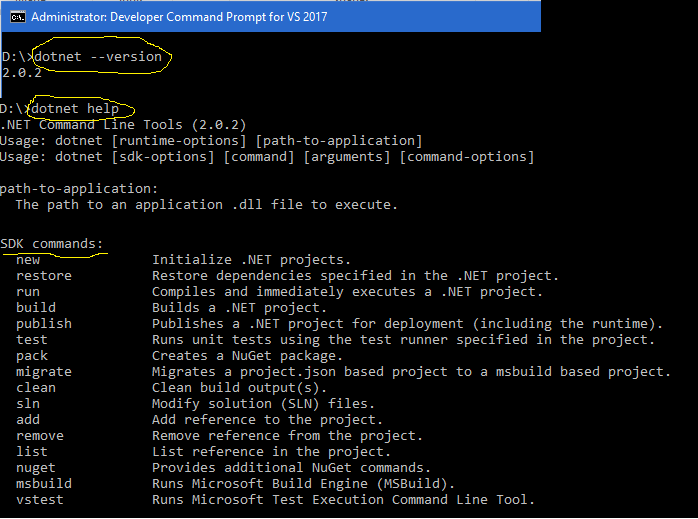 The .NET Core command-line interface (CLI) is a new cross-platform tool for developing .NET based applications. Tools such as Integrated Development Environments (IDEs) can rest on CLI. CLI can be thought as a foundation of IDE like Visual Studio. The command (or "verb") is simply a command that performs an action. For example, 'dotnet --version' returns the current version of .Net Core. 'dotnet help' returns all the command list and other values which are helpful for a developer. The commands are implemented as a console application using a dotnet [verb] convention. In .Net Core CLI, the first keyword is 'dotnet' and then argument. For eg - dotnet new console - This command will create a console application in the current directory.